I have to make another about today, because I just had the best ride in ages – out on trails with company, trotting and cantering along under the cloudless blue sky, with the amazing colors of a New England fall bright and backlit all around me (and sometimes stuck into my helmet!). 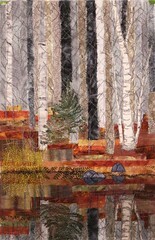 the last few blog entries are so full of the delights of fall-bird colors and trees (trees!!! ), family circus, and riding. this is the time of year i miss riding the most. riding in the western adirondacks on my thoroughbred mare- oh, lord, what could be better? I thought of you whilst on a few days away at the beach – took a couple of photos of pictures in the sand as they reminded me of the river work you did. Will link to them this week.